... Define a time period using the wizard? 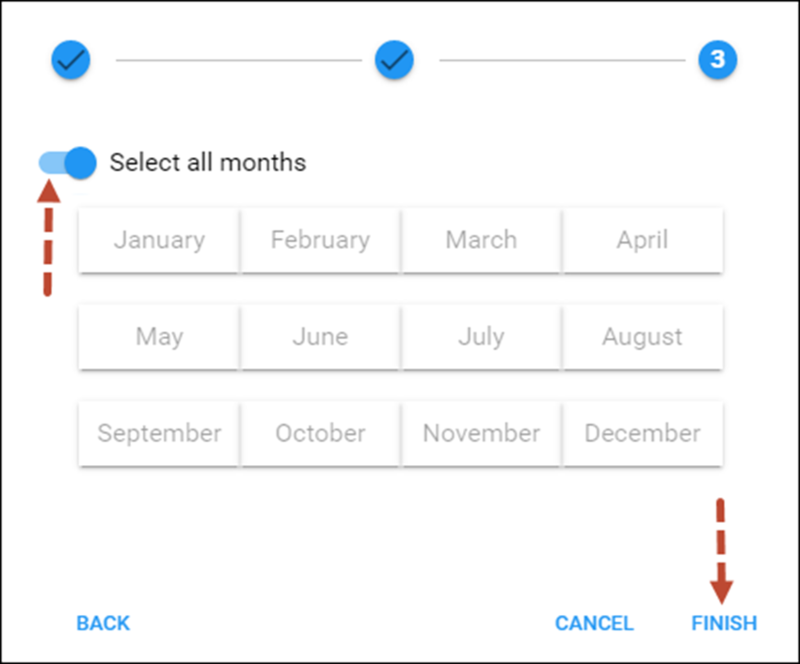 … Enable end users to manage the answering mode via IVR? ... Create extra DIDs as aliases? ... Limit the number of concurrent calls for a specific customer? … Configure extension dialing bypassing menu prompt? Using follow-me you can forward calls to multiple destinations. You can also configure it so that each of these destinations will be active in its own time period. For example, let’s suppose you want to redirect all your calls from 8 p.m. till 8 a.m. to your cell phone (e.g. 12065550022) in case your IP phone is offline. 1. On the navigation menu, select Toolbox, click Find account and search for the desired account. 2. On the Account page, go to the Service configuration panel and select Voice calls. · Call forwarding – Specify Follow-Me. · Default answering mode – Specify Forward Only. 4. The additional Follow-Me tab now appears on the screen. Choose this tab. 5. Click Add to add the number on which you want to receive forwarded calls. o If you set As listed, then every active number will be called, from the first number to the last one. o If you would like to call all numbers from the list simultaneously, use Simultaneous. o For random order, select Random. o If you want to call the destination numbers based on the percentage specified, use Percentage Split. · Name – Type in a name for the follow-me number (the cell phone number in the example). · Destination – Enter a number for redirecting calls (e.g. 12065550022). · Active – Define the period when the number is active and is allowed to receive a forwarded call. Click the Active link orwizard icon to create a period. If you want the follow-me number to be active permanently, click the Always button while on the Period Wizard page. See the ... define a time period using the wizard? section for more details. · Timeout – Set the amount of seconds to wait before a call is forwarded to the next number in the list if the call is not answered. · Off – If you wish to temporarily disable forwarding to this follow-me number, check this option. 7. Click the Save icon to save the results of your work. 8. Repeat steps 5-7 until all the desired follow-me numbers have been added. · Call forwarding – Specify Advanced Forwarding. · Default answering mode – Specify the method of processing incoming calls. Choose Forward only if you do not want the call to go to voicemail if not answered. Otherwise, choose Forward Then Voicemail here. 4. The additional Follow Me tab now appears on the screen. Choose this tab. 6. Enter the information needed. The fields are very similar to those for adding a follow-me number as described above. 7. Below are additional fields that are not available when adding a follow-me number. · SIP Proxy – Select SIP proxies from the drop-down menu (the SIP proxies that are available for a certain customer should be specified in the Addressees field in the Incoming calls section on the customer’s Service configuration tab). · Transport Protocol – Enables you to choose the UDP or TCP transport protocol. You can use the TCP protocol instead of UDP for SIP communications for PBXs which do not support UDP. · Keep Original CLD – Check this option to ensure that the originally dialed number is present in the call information when forwarding a call to another account. 8. Click the Save icon to save the results of your work. The simplest type of forwarding is when you specify a single phone number to which all calls will be sent. For example, if you wish to redirect all your calls to 18185551219, use simple forwarding. · Call forwarding – Select Simple Forwarding. · Default answering mode – Specify Forward only or Forward Then Voicemail if you want your calls to be forwarded to voicemail if not answered. 4. Go to the Forward tab. · Timeout – Set how long the IP phone will ring before a call goes to voicemail (if Forward then voicemail is set in the Default Answering Mode field) or is disconnected. · Keep Original CLD – If this is checked, then the originally dialed number will be preserved during forwarding. · Calling Party Display – Choose one of the ways to display the caller’s info during forwarding (a detailed description of each option is given above). · Limit Simultaneous Calls To – Specify the allowed number of concurrent calls here. When an account tries to place a call beyond the allowed limit, it will be rejected. Using the period definition wizard, you can easily define the time period when a number (e.g. a follow-me number) will be active. If you want the number to be active permanently, click the Always button at the bottom of the Period Wizard page. Otherwise, define the desired period. The following example illustrates the process of creating a period that starts at 8pm and lasts until 8am the next morning on workdays. 1. On the first page of the wizard, select 8 pm in the From box and 8 am in the Until box. Then click Next. 2. 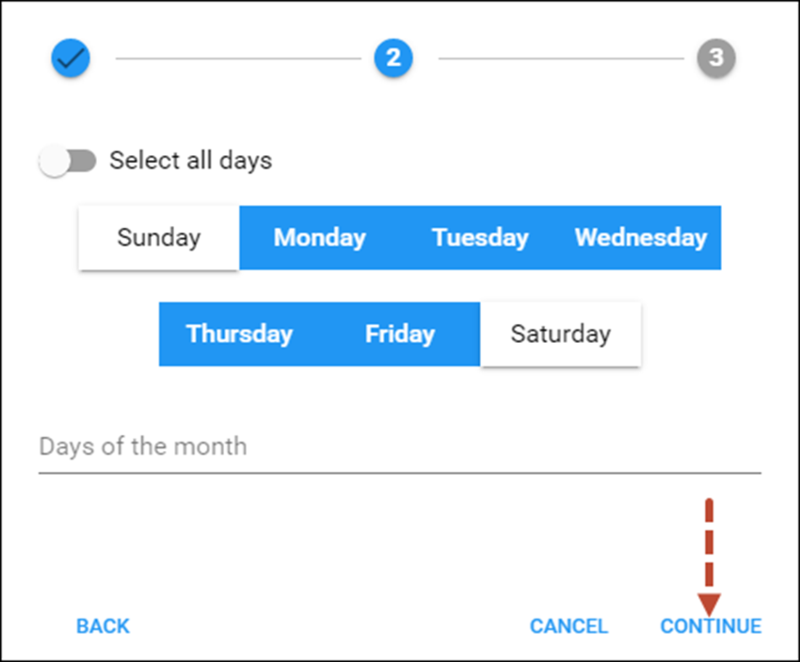 Select Workdays in the Day of week box and click Next to go to the next page. 3. Click Skip on the following two pages defining Day of month and Month. 4. Click Finish to complete the period definition. If you wish to set one more definition for this period, click Add another definition to this period. This chapter demonstrates how to enable end users to choose a method for processing incoming calls and how to specify the number the incoming calls will be forwarded to using a special IVR. Define which IVR application launches when an end user dials an access number to manage answering mode. · Name – Specify the IVR application’s name (e.g. Call forwarding). · Application type – Select Call forwarding management. · Entry point – type in the number to be dialed by an end user. Click to add more Entry points. To allow end users to define a method of processing incoming calls by themselves, modify the service configuration within the product assigned to them. 1. On your product’s panel, click Services, then click Voice calls. 2. On the Voice calls configuration panel, click Incoming calls and use a slider to enableUnified messaging service feature. 3. Use a slider to enable the Call forwarding feature and select the End-users check box. NOTE: Enabling the End-users check box for Call forwarding is mandatory to permit end users to modify how to process incoming calls via an IVR and their account self-care interface. To permit end users to modify the method for processing incoming calls only via an IVR, restrict them to accessing only the account self-care interface. 4. To allow end users to define a phone number to forward calls to, select Simple forwarding in the Call forwarding field. 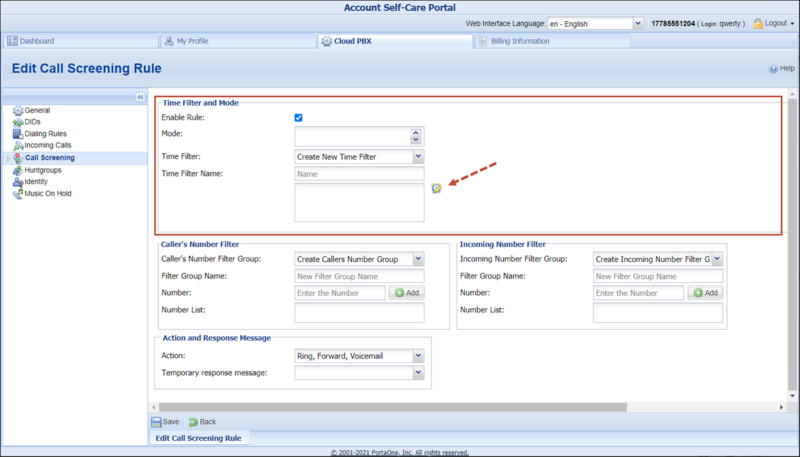 On the Call Screening page of Account Self-Care Portal you can define and view a list of rules for handling incoming calls. 3. On the Voice calls configuration panel, select Incoming calls and enable Call screening service feature. Log on with the account’s web access login and password. After that you will be able to see the account’s dashboard interface. 1. 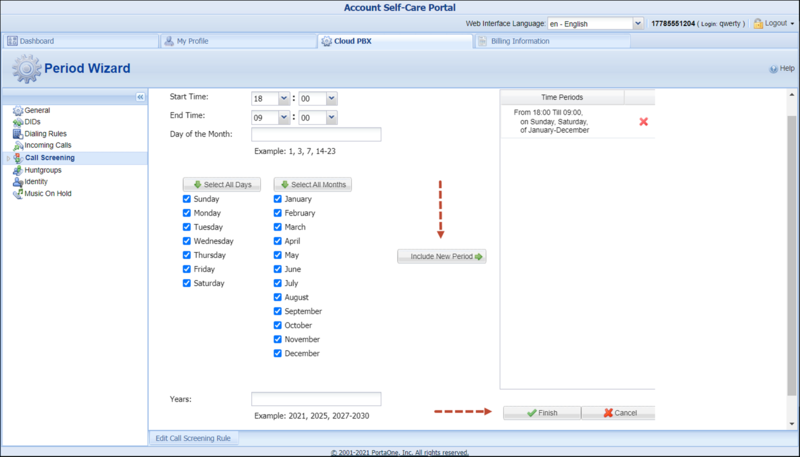 On the IP Centrex tab of the Account self-care interface, go to Call Screening page and click the Add new rule button. · Enable Rule – Check this box to enable this rule. · Action – Choose Forward Only. Refer to the Simple Forwarding section of this document for instructions on how to configure forwarding to your mobile number. · Time Filter – Allows you to select a condition applicable to the time when a call is made. Select Create New Time Filter here. · Time Filter Name – Enter the name for a new time window. To set specific parameters for your Time Filter, click the Time Interval icon to define the interval. 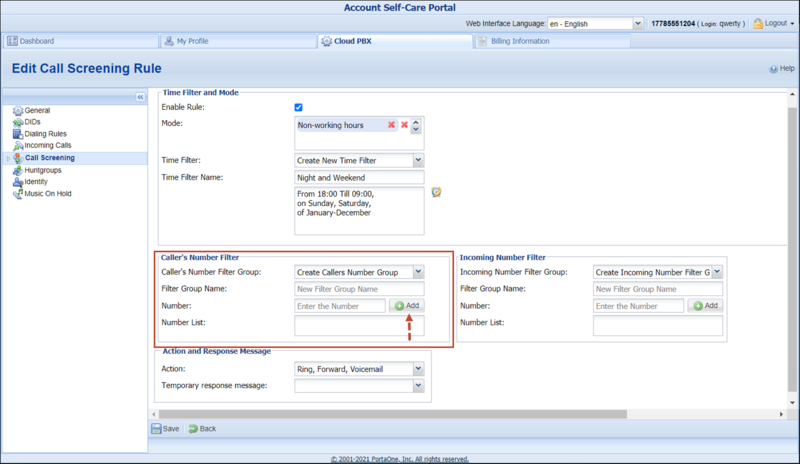 · Caller's Number Filter Group – Select a condition applicable to an incoming phone number (phone number of a person trying to contact you). · Filter Group Name – Type in the name of a Filter Group (e.g VIP partners). · Number – Add the number(s) to your filter group. First enter the number and then click the Add button. · Number List – The numbers you have added to the group are displayed here. · Incoming Number Filter Group – Allows you to select a condition applicable to one of your phone numbers that a person tries to contact you. · Filter Group Name – Enter the name for the new filter group (e. g. Work phone). Repeat the previous steps to create more call screening rules if necessary. NOTE: If a user modifies already created filter groups then the changes are applied for all other call screening rules where these filter groups are used. You can use phone numbers (e.g. DIDs 44012555772, 17785551208 and 18701191444) to forward incoming calls to the main (IP PBX) account. To do that, add those numbers as aliases. 1. On the Account panel, click Personal info and select Aliases. · Alias role – Select Phone line here. · Alias ID – Specify the DID number in this field. · Allow authentication – Disable this option. 3. Repeat step 1-2 to add additional aliases. TIP: You can associate the above-mentioned phone numbers to a single account (e.g. 17785551204) and then register those numbers on separate IP phones. This allows your users to make and receive outgoing and incoming calls. To do that, add those numbers as aliases and enable the Allow authentication parameter. To create multiple aliases use the Alias Generator tool. 1. Open the Account Info form for an existing account, and go to the Aliases tab. 2. Click the Generate Aliases button. · Number of accounts – Number of aliases to be generated. · Allow Authentication / Registration – Leave this check box clear. · Pricing Batch – Select a corresponding pricing batch from the Pricing Batch menu. · If you wish, you can manually enter the starting DID or use the dialog box, e.g. if you want to make sure that the customer’s phone range starts with a “round” phone number such as 00, followed by 01, 02, etc. 4. Click Generate to initiate the alias generation process. 1. On the navigation menu, go to Sales, select Customers and open the needed customer. 2. On the Customer panel, click Personal and select Sites. 3. On the Sites panel, click Add a site. On the Adding a site page that opens, type in the Site name (e.g. Head Office) and click the Add button. · Type of calls – Select All calls here. · Simultaneous calls – Define the number of concurrent calls for the accounts of this customer. 1. Go to the Account Self-Care Portal. 2. On the Auto Attendant page of the IP Centrex tab open the ROOT menu. 3. On the General tab specify when the ROOT menu is active. 4. Enable the Allow callers to dial a known extension directly option. 5. Adjusts the Interdigit timeout when entering an extension option value. This is the maximum number of seconds the system waits till a user dials the second and following digits of an extension. Note that the enabled Allow callers to dial a known extension directly option disables the Dial Extension Directly menu action. · Action – Queue “Name”.